The new owners of Erik Buell Racing, Liquid Asset Partners, announced their intentions to relaunch the iconic American brand, from making repair parts available by next week to producing 2016 EBR RX and SX models by mid-March. Bruce Belfer, CEO of Atlantic Metals Group LLC, revealed in an interview with the Milwaukee Business Journal that he plans to reopen Erik Buell Racing. Buell Motorcycles’ East Troy factory will be liquidated, with a sale to the public of the company’s equipment and machinery. Buell has issued a recall for its touring machines the 2010 XB12Xs and XB12XTs due to the righthand side footpeg possibly being manufactured out of spec. It’s the end of the line for Buell, literally, as the final of 136,923 motorcycles produced by the American manufacturer rolled off its East Troy assembly line. 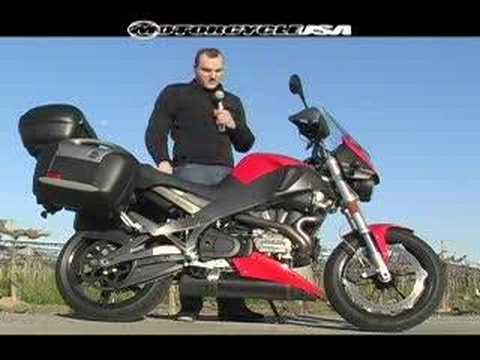 The 2009 Buell 1125CR goes up against the Aprilia Tuono 1000R and Ducati Streetfighter in this Streetfighter motorcycle comparison review. Find out how this motorcycle stacks up against the competition. We took a 2008 Buell Super TT and a 2008 Ducati Hypermotard out for a good thrashing on the road and track for a little head-to-head comparison between these two big-bored air-cooled V-Twins motorcycles. Buell street bikes include naked streetfighters like the new 1125CR, along with the Firebolt and Lightning, as well as the adventure-touring Ulysses. The Buell Blast is a popular entry-level motorcycle. Most of the Buell street bikes utilize the air-cooled 1203cc Thunderstorm V-Twin. It powers the XB12R Firebolt, a partially faired street bike, as well as the XB12S Lightnings – naked street bike designs. The adventure-touring Ulysses also uses the Thunderstorm Twin, with the new 1125CR sourcing the 1125 Helicon V-Twin. History of Buell Motorcycles.